View our full collection of modern reception area desks and credenzas we think will inspire you! As you peruse these office reception-area designs, notice how each features a design element that makes it unique unto itself. 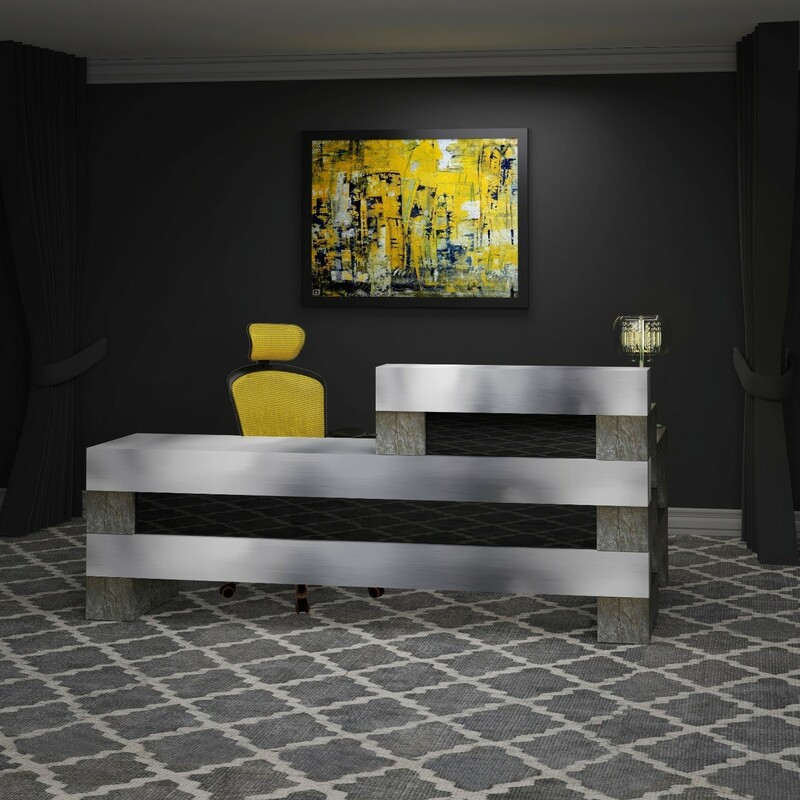 One reception area may feature a cool color combination, while another may have a special collection of materials. While they are all unique in their own right, certain designs may or may not fit your room or business style. 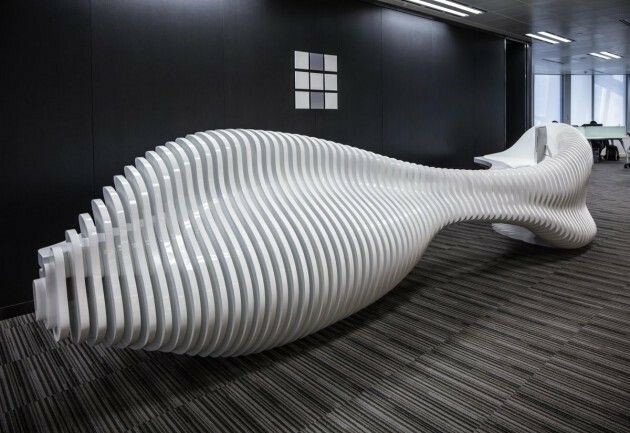 Even so, they can offer up inspirational ideas that will allow you to peer into the realm of office design possibility, and motivate and inspire you to integrate the modern office design movement into your workspace. Modern Reception Area Lighting. 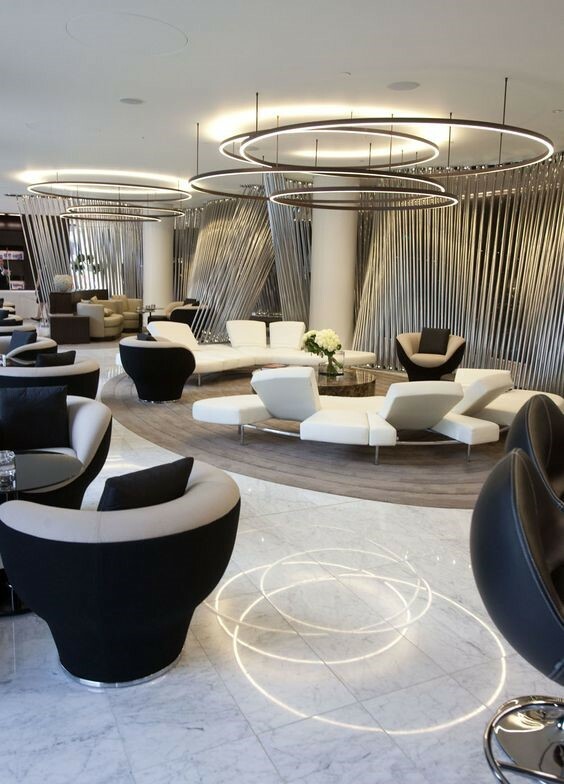 Lighting can serve as an interesting and highly noticeable element in any reception area. What’s more, it knocks at the door of our perceived reception-area design limitations, challenging our thinking. With its unique balance of function, dissymmetry, and visual perception, lighting engages the visitor in a complete invitational experience. Whether you think this design is one you can work with or not, it serves up opportunities for thinking past the commonplace. This room takes an interesting look at how to combine non-typical materials, shapes, and colors into an approach that’s different from what’s usually found in common reception-area design. Its depth of color in the black walls and straight-lined reception desk offers a non-complex reception area unencumbered by stuff. The design elements of metal, stone, and black acrylic glass let visitors know that you take detials seriously. Cool, Modern Reception Space. This modern reception space, with its minimalist esthetic, projects a strong sense of style with a bold reception desk, clean lines of color, and simplicity of design. With open windows and zero fuss, this space lives in modern fashion. 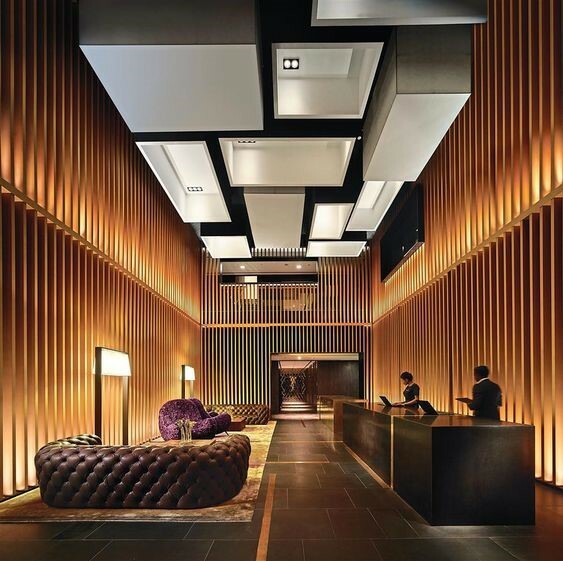 In the modern world, where the focus is often on white reception furniture, bright colors, laminates, and cool workspaces, this hotel reception area takes a 90-degree turn to add warm, natural elements. Companies offering natural, earthy products and mindsets can use wood as an alternative to laminate, glass, and metal. 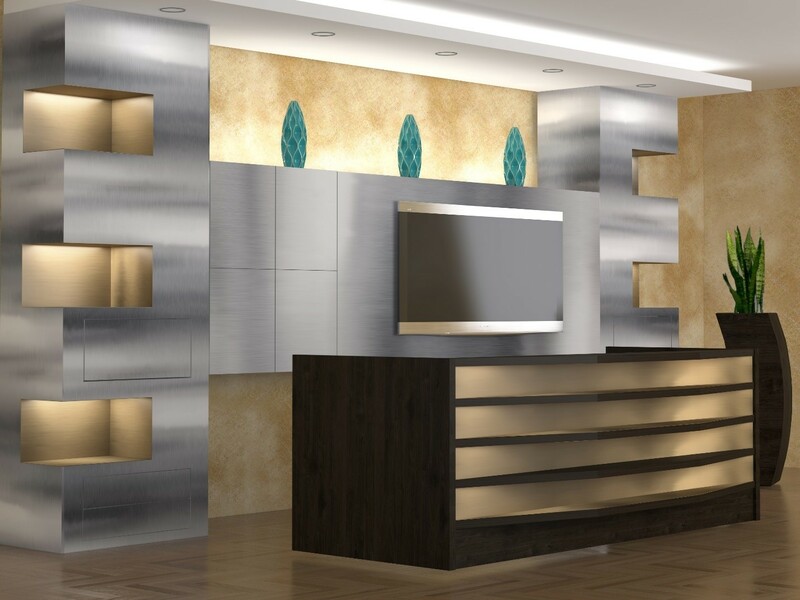 A combination of contrasting metals, like brushed aluminum and bronze, adds a futuristic approach to reception space design. While metal is normally thought of as industrial, including it with a brushed finish can make it more resistant to visible scratches. The addition of a wood reception desk warms an otherwise cool workspace. There is no question about it: color can add excitement to any reception area where backgrounds are simple, clean, and monotone. While this reception area is displayed as bright, sunny, and happy, you can use your choice of bright, bold colors to underscore your company’s theme. Strategic use of color gives this modern reception area a unique design, changing the mood of the space in the process. 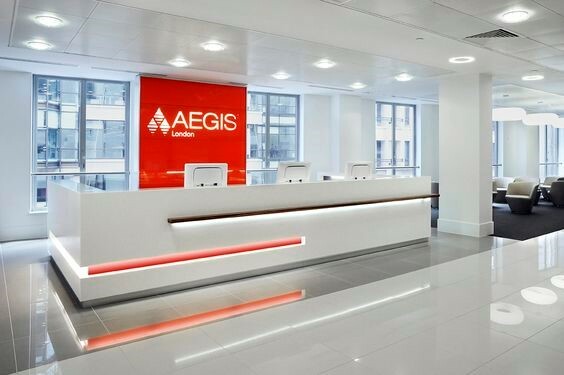 Reception spaces are instrumental to the mindset of customers visiting your business. 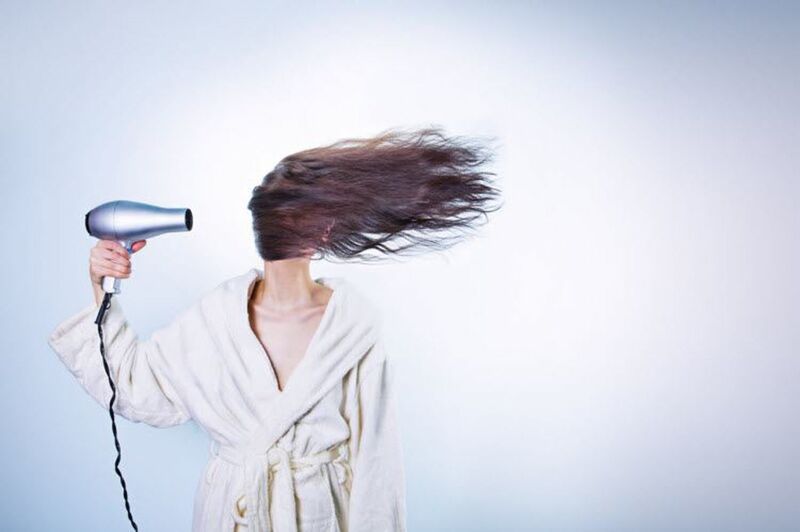 After all, a lot of good things come out of them: agreements, creative ideas, settlements, new directions, partnerships, new ventures, mergers, depositions, new hires, product and packaging designs, and more. You can either leave the emotions generated there to chance, or you can be proactive. Using Unique Shapes to Create Interest The use of shape as a design tool can provide you with a dynamic strategy. 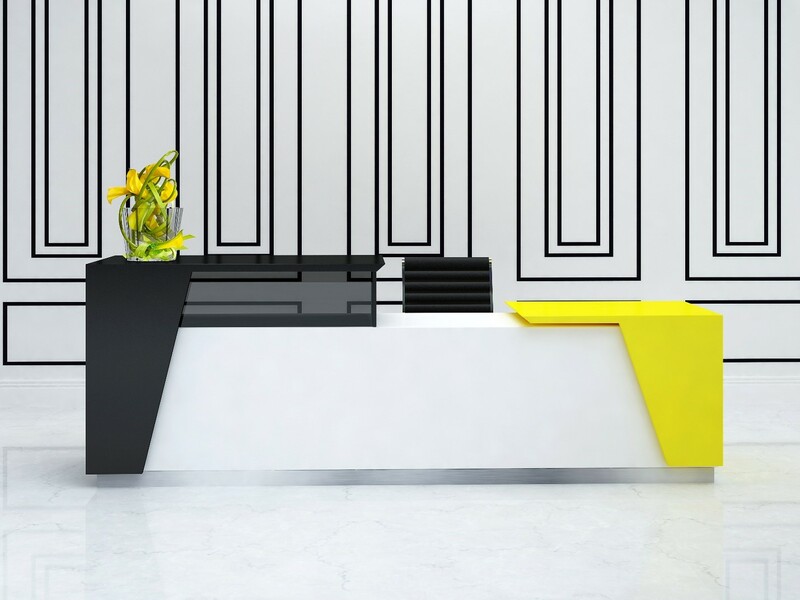 Geometric accents in bold colors—or primary elements in soft, neutral colors—can bring interest and a WOW factor to the design of your reception area. Curves, triangles, stripes, and squares look awesome in your entryway. When shapes are done in bright colors, they heighten the drama in the space. The shapes you choose can be simple, but when combined with contrasting elements, they can be totally effective.